In this paper, we propose a novel mechanism for spectrum sensing that leads us to exploit the spatio-temporal correlation present in the received signal at a multi-antenna receiver. For the proposed mechanism, we formulate the spectrum sensing scheme by adopting the generalized likelihood ratio test (GLRT). However, the GLRT degenerates in the case of limited sample support. To circumvent this problem, several extensions are proposed that bring robustness to the GLRT in the case of high dimensionality and small sample size. In order to achieve these sample-efficient detection schemes, we modify the GLRT-based detector by exploiting the covariance structure and factoring the large spatio-temporal covariance matrix into spatial and temporal covariance matrices. The performance of the proposed detectors is evaluated by means of numerical simulations, showing important advantages over existing detectors. 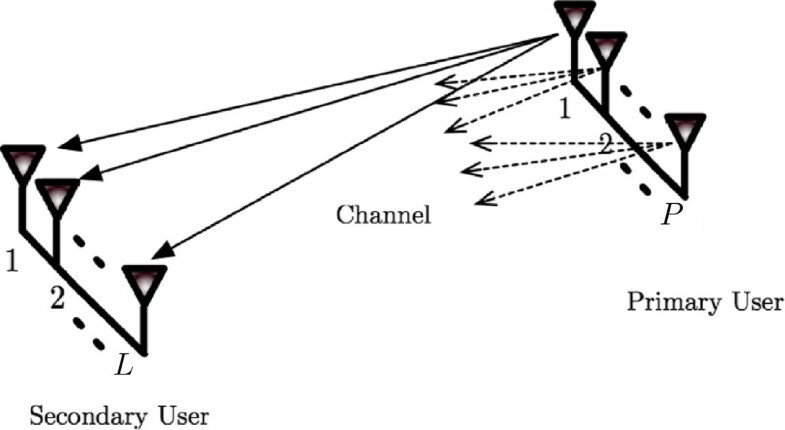 For a cognitive radio system, which opportunistically accesses the wireless channel, spectrum sensing becomes a crucial task for detecting the presence of primary user transmissions . Recently, sensors with multiple antennas have become an integral part of many cognitive receivers [2, 3], thus giving us the chance to consider multi-antenna techniques to improve the performance of spectrum sensing. Multiple antennas can offer spatial diversity and improve the spectrum sensing performance [4, 5]. Intuitively, the presence of any primary signal should result in some spatial correlation in the observations received at the multi-antenna receivers  and thus, exploiting this correlation improves the primary user detection performance. In addition to being spatially correlated, the received signal samples are usually correlated (wide-sense stationary) in time due to presence of a temporal dispersive channel, oversampling of the received signals or just because the originally transmitted signals are correlated in time [5, 6]. This spatio-temporal correlation is a feature that can be used for detection purposes, since the remaining (i.e. undesired) noise processes at different antennas can be safely assumed statistically independent, both in time and space. Spectrum sensing methods that only exploit the spatial structure of the received signal covariance matrix have been of great interest in the recent years . The majority of these schemes are based on multivariate statistical inference theory [7, 8], and interested readers can find comprehensive details in (, Ch. 9-10), which discusses multivariate detectors for testing the independence of random observations with the help of the generalized likelihood ratio test (GLRT). These GLRT-based detectors typically end up in a simple quotient between the determinant of the sample covariance matrix and the determinant of its diagonal version, and these tests have been widely applied to the detection of signals especially in the context of cognitive radios [2, 9]. Through careful study of various existing spectrum sensing techniques, one can conclude that the signal’s temporal correlation is not fully exploited in most of these techniques. In fact, in most of them, temporal correlation is ignored or considered as a deleterious effect. In the very few works that exploit the temporal correlation, they usually assume some prior knowledge about it [10–14]. One of the reasons for ignoring or only partially exploiting temporal correlation is that it often makes it difficult to achieve tractable solutions. However, the exploitation of temporal correlation jointly with spatial correlation can provide us extra side information to enhance the detection performance. Hence, it will be interesting to find ways to devise detection mechanisms that exploit temporal correlation with tractable solutions. Taking this into account, the main focus of this work is to develop a multi-antenna detector that robustly exploits spatio-temporal correlation. In order to do so, we propose a signal model that leads us to tractable detection schemes while exploiting the temporal correlation jointly with spatial correlation. In order to achieve the proposed goal, we start with our earlier work in , where we derived the GLRT. This detector basically tests whether the covariance matrix is block diagonal or not. To make the discussion and notation simple, for our case, we call this GLRT scheme the spatio-temporal GLRT (ST-GLRT). Compared to the traditional spatial covariance-based GLRT, the ST-GLRT provides some improved performance. The reason for this is that the ST-GLRT scheme exploits temporal correlation as an additional feature on top of spatial correlation and energy. However, since any GLRT involves the estimation of unknown parameters (e.g., covariance matrix), its performance depends on the sample size and the dimensionality of the signal model. In practice, the GLRT is used based on the assumption that the sample size is large compared to the model dimension. When this is not the case, the performance of the GLRT degenerates because the sample covariance matrix becomes singular, and the whole problem becomes ill-conditioned [16, 17]. In the case of the ST-GLRT, we have to deal with both the spatial and temporal dimensions, and hence, the overall data dimension is even larger. Thus, the ST-GLRT has some further limitations when the detection process requires a quick decision, as it is in the case of the detection of primary signals in cognitive radio. Hence, although for the large sample support, the ST-GLRT can certainly achieve an improved detection performance; for small sample support, it has some limitations that deserve a detailed study. In order to reduce the demand for large sample support and bring robustness to the ST-GLRT, one may assume existence of some underlying structure based on the spatial and temporal components of the covariance matrix. In our earlier work [15, 18], by assuming wide sense stationary (WSS), we exploited the Toeplitz structure of the covariance matrix. Doing so, we proposed an approximated GLRT in the frequency domain that leads to robustness against the small sample support. Contrary to that work, in the present one, we rather focus on exploiting the covariance structures without the GLRT approximation in the frequency domain. In particular, we approximate the block-Toeplitz structure of a multivariate WSS process as persymmetric. Doing so, we will take advantage of the result in  which states that by exploiting the persymmetric structure, the number of independent vector measurements required for the covariance matrix estimator can be decreased by up to a factor of two. This will certainly bring down the demand for high sample support required for the ST-GLRT to not degenerate and provide robustness against the repercussions of small sample support and large dimensional data. Moving one step forward, we also approximate the block-Toeplitz structure of the spatio-temporal correlated multi-antenna measurements with a Kronecker product structure [20, 21]. Recently, exploitation of the Kronecker structure in covariance matrices has received a lot of interest in statistics [22, 23]. Moreover, the maximum likelihood (ML) method for estimating the covariance matrix based on the Kronecker product has been previously discussed in [22, 23]. Similarly, in the cases where the correlation structure is not separable through the Kronecker product,  discusses some insightful details about the nearest Kronecker product approximations. In this paper, we use the Kronecker structure to reformulate the ST-GLRT by taking advantage of the inherent spatio-temporal structure of the received observations. In order to do so, we adopt and extend our earlier work  by using the Kronecker product to efficiently exploit the space-time correlation in a multi-antenna spectrum sensing scheme. In addition to the Kronecker product-based factorization, we also exploit the fact that the factored matrices could have additional persymmetric structure . 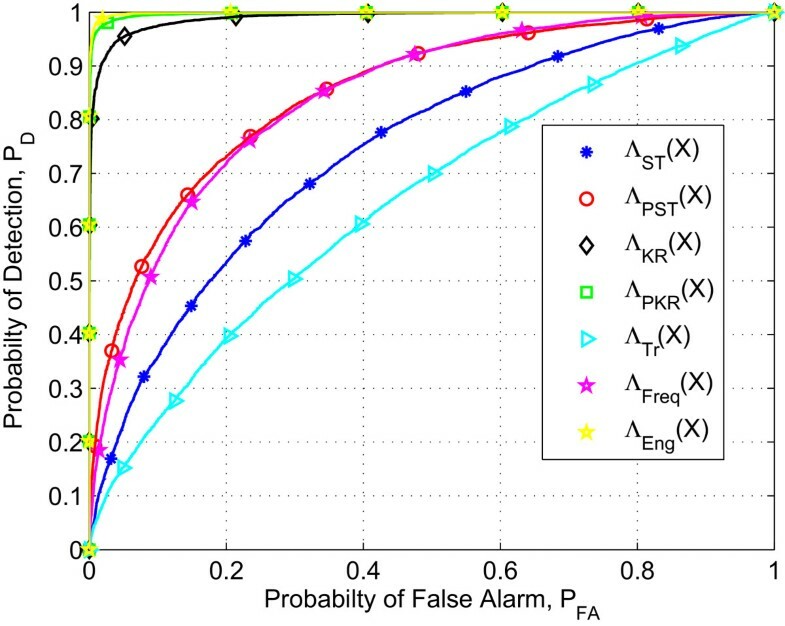 Therefore, by exploiting the Kronecker product structure jointly with the persymmetric structure, the performance of the proposed detection scheme can further be improved in terms of the required number of sample to estimate the covariance matrix (i.e. the detector efficiency). To compare the proposed methods with traditional techniques, numerical simulations are conducted. 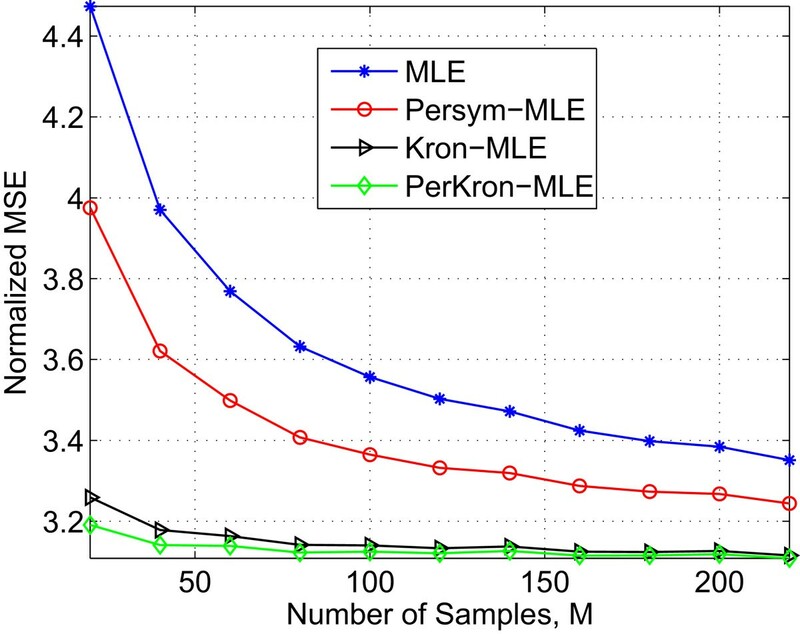 These results illustrate that the proposed detection schemes indeed outperform the traditional approaches, especially in the case of small sample support. The remainder of the paper is organized as follows. Section 2 introduces the proposed methodology and the signal model. In Section 3, we solve the problem by using the traditional GLRT formulations. The proposed detection schemes are derived in Sections 4 and 5. Numerical results are provided in Section 6. The conclusion is finally drawn in Section 7. System model for a single secondary user equipped with multiple antennas and multi-antenna primary user. We split the received block of N T vectors x(n) into M sub-blocks where each block contains N samples of vector x(n), as shown in Figure 2. 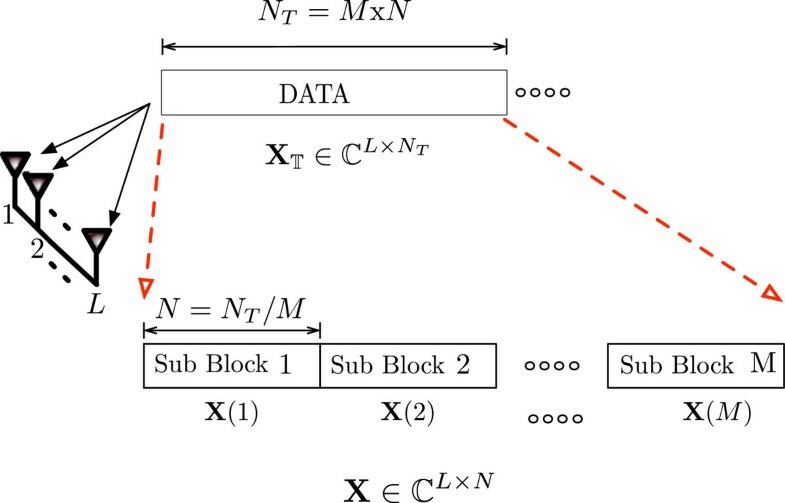 We assume that the consecutive vector-valued samples within each sub-block are temporally correlated with N × N temporal correlation matrix C t .
Independence is assumed between consecutive sub-blocks. Schematic representation of the proposed methodology for slicing the observation block into M sub-blocks. It is clear that the proposed approach does not exploit the correlation among different sub-blocks. However, as it will become clear in the following sections, exploiting such correlation would result in an ill-posed problem. This would make it intractable to derive the ML estimators of the covariance matrices, required for the generalized likelihood ratio test (GLRT). The proposed mechanism could also be motivated from the concept of correlated block-fading channel, which presents correlation in each N-samples block, but independence between consecutive blocks [6, 26]. 1 ℋ 0 : z ∼ C N 0 , Σ 0 , ℋ 1 : z ∼ C N 0 , Σ .
and σ i 2 , i = 1 , 2 , … , L is noise power at i-th antenna of the array. f z Z ; Σ = 1 π MLN Σ M exp - M tr Σ - 1 Σ ̂ . f z Z , Σ 0 = f z Z ; Σ A , 0 ⊗ I N = Σ A , 0 ⊗ I N - M × exp - ∑ m = 1 M z ( m ) Σ A,0 - 1 ⊗ I N z H ( m ) . Note that the detection scheme in (9) assumes no structure for the covariance matrix, except that the covariance matrix is Hermitian and non-singular. where Σ A , 1 = 1 N T ∑ n = 1 N T x ( n ) x H ( n ) is a sample covariance matrix. Under the hypothesis ℋ 0 , as we have previously shown, the covariance matrix may be estimated as: ΣA,0 = diag(ΣA,1) . The detector (11) only exploits the energy and the spatial correlation across the L antennas of the receiver and it wrongly assumes independence in time the information provided by the temporal correlation. Compared to (11), the ST-GLRT (9) provides improved detection performance since it uses temporal correlation as an additional source of information. However, in the case when M < N L, the ST-GLRT may completely collapse due to the ill-conditioned sample covariance matrix . In order to circumvent this limitation, in the following sections, we propose some modifications in the ST-GLRT by exploiting the presence of some inherent structures in the space-time correlation. In order to solve the detection problem (3) with unknown covariance matrices, a critical requirement for the detectors based on the GLRT is that the sample covariance matrices must be non-singular . To this end, we have to make sure that the number of available observations given by M, is not smaller than LN (i.e. M ≥ L N). However, in quick spectrum sensing, a number of samples greater than LN is a requirement difficult to fulfill in practice . Hence, the motivation of the remaining discussion is to bring robustness against this small sample support. Note that in (9) we assume no prior knowledge about the spatio-temporal structure of the covariance matrix except that it is positive definite. One way to achieve the robustness against the small sample support is to look for possible a-priori known patterns/structures in the large spatio-temporal covariance matrix. also known as exchange matrix . Based on these ideas, in Section 4.2, we present a modified GLRT that exploits the persymmetric property of the block-Toeplitz covariance matrix. log f z ( B ) Z ; Σ = - log Σ - tr Σ - 1 J LN Σ ̂ T J LN . Σ ̂ PS = 1 2 Σ ̂ + J LN Σ ̂ T J LN . Λ PS Z = Σ ̂ PS Σ ̂ 0 ≷ ℋ 1 ℋ 0 γ .
where Σ ̂ 0 = Σ ̂ A , 0 ⊗ I N as before. Compared to the detection scheme in (9), the new one in (19) offers improved performance at small sample support, as the number of independent vector measurements required for the covariance matrix estimator decreases by up to a factor of two . Motivated by these facts, in Section 5, we go one step further and exploit the properties of the Kronecker product to decompose the large covariance matrix into smaller ones, reducing considerably the number of unknown parameters. Σ = Σ A ⊗ Σ T .
In (20), the matrix ΣA captures the spatial correlation between the observations received at different antennas and matrix ΣT captures the time correlation between N column vectors in X. Herein, we remark that the covariance structure in (20) makes the implicit assumption that the temporal correlation structure remains the same at all spatial locations. Similarly, the spatial correlation structure remains the same for the whole sub-block. Λ KR ( Z ) = max Σ 0 f z Z ; Σ 0 max Σ T , Σ A f z Z ; Σ A ⊗ Σ T ≷ ℋ 1 ℋ 0 γ .
f z Z ; Σ A ⊗ Σ T = Σ A ⊗ Σ T - M × exp - ∑ m = 1 M z H ( m ) Σ A - 1 ⊗ Σ T - 1 z ( m ) . Σ ̂ A = 1 NM ∑ m = 1 M X m Σ ̂ T - 1 X H m .
1 Λ KR ( Z ) = Σ ̂ T L Σ ̂ A N Σ ̂ 0 ≷ ℋ 1 ℋ 0 γ . The main advantage of the proposed GLRT (27) over the traditional is that under ℋ 1 instead of 1 2 LN ( LN + 1 ) parameters, it has only 1 2 L L + 1 + 1 2 N N + 1 parameters to estimate. Furthermore, the dimensions of these two covariance matrices ΣT and ΣA are much smaller than the dimension of full covariance matrix Σ, that is why the computations are much less demanding. Hence, the Kronecker model is a good approximation that captures important information about the correlations, while it is positive definite for M ≥ max (N/L; L/N) + 1, i.e. a much smaller number of samples. log f z F Z ; Σ A ⊗ Σ T = - N log Σ A - L log Σ T - 1 M ∑ m = 1 M tr Σ T - 1 X H m Σ A - 1 X m .
1 Λ PKR ( Z ) = Σ ̂ PS , T L Σ ̂ PS , A N Σ ̂ 0 ≷ ℋ 1 ℋ 0 γ . Compared to (27), (36) provides better detection performance in the small sample support regime. It is because, finding the estimates of ΣT and ΣA, (34) and (35) require smaller M compared to (25) and (26). In conclusion, by exploiting the underlying structure of the covariance matrix Σ via the persymmetric ML estimates of the covariance matrices ΣT and ΣA, it further increases the robustness of (27) at small sample support. In this experiment, we assume that the signal received at the multi-antenna receiver is a vector WSS Gaussian process corrupted by uncorrelated noise. In order to assess the detectors with this assumption, the SNRs (expected) κ l ,l = 1,2,⋯,L are allocated differently, with average SNR of all antennas is: κ ̄ = 1 L ∑ l = 1 L κ l . For a specified received signal power (equal at different antennas) and κ ̄ , we find P n , the mean noise power. Noise powers (expectedb) at L different antennas σ n , l 2 , l = 1 , 2 , ⋯ , L are kept different while P n = 1 L ∑ i = 1 L σ n , l 2 . Moreover, we assume L = 4 antennas and a separable spatio-temporal correlation. The spatial covariance matrix is generated as [ ΣA]i,j= 0.3|i-j|, i,j = 1,…,L, and the temporal covariance matrix is generated as [ ΣT]i,j= 0.9|i-j|, i,j = 1,…,N T . The remaining parameters for each experiment are described in the captions of the corresponding diagrams. and the frequency-domain detector is given by (39) in A Approximated GLRT in the frequency domain. It is to be noted that the energy detector assumes known noise power. In this experiment, we plot ROC curves for two different cases. In the first case, we assume that the unknown noise powers at different antennas are perfectly estimated and there is no noise power uncertainty. The ROC plots are given in Figure 3. In the second part of this experiment, shown in Figure 4, we repeat the same experimental setup for the case with noise power uncertainty. 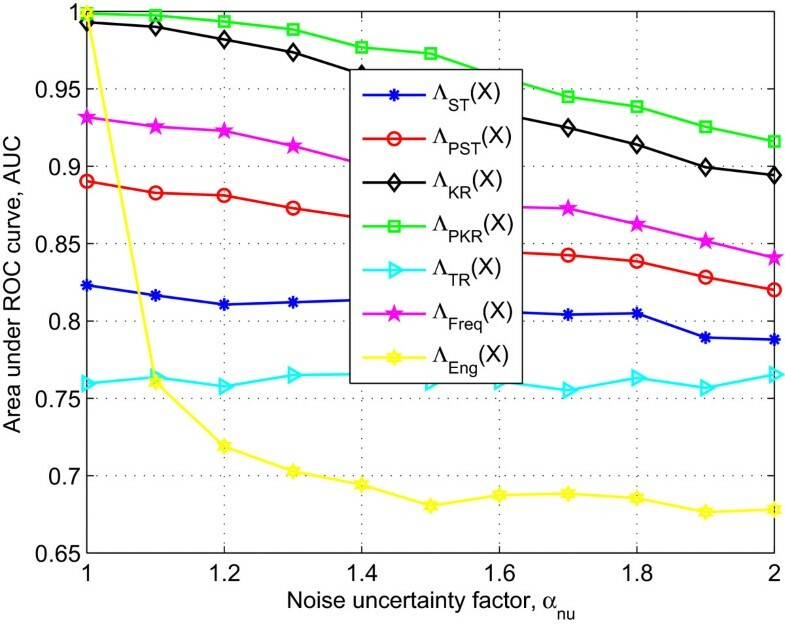 Note that we model the noise power uncertainty by generating the noise power at the l-th antenna as σ w , l 2 ∼ U σ n , l 2 α nu , α nu σ n , l 2 , where α nu ≥ 1, and α nu = 1 means no noise uncertainty . From the results, it is clear that the proposed schemes clearly outperform traditional schemes. Moreover, from the experiment, we can also conclude that the noise power uncertainty slightly deteriorates the performance of all detectors. However, the energy detector completely collapses at α nu =2. To further analyze the effects of the sample support, noise power uncertainty, and shadowing parameters, we need to have a single and quantitative figure of merit. This metric is the area under the ROC curve (AUC), which varies between 0.5 (poor performance) and 1 (good performance). Hence, next, we use AUC curves to see effects of the sample support, noise power uncertainty, and shadowing parameters on the detection performance of the spectrum sensing schemes. We model the shadowing effect by using log-normal random variable as: p sh = p m 1 0 x σ / 10 , where p m is the expected signal power at the receiver (equal for all antennas), p sh is the signal power after shadowing effect, and x σ is Gaussian random variable with 0 mean and standard deviation σSh. The log-normal shadow fading is often characterized by its dB spread, σdB, which has the relationship σSh = 0.1σdB log10 . ROC curves for comparison of detection schemes: sample support size M = 70, number of vector samples per sub-block N = 10, number of antennas L = 4, noise uncertainty α nu = 1, and average SNR κ ̄ = - 10 dB . 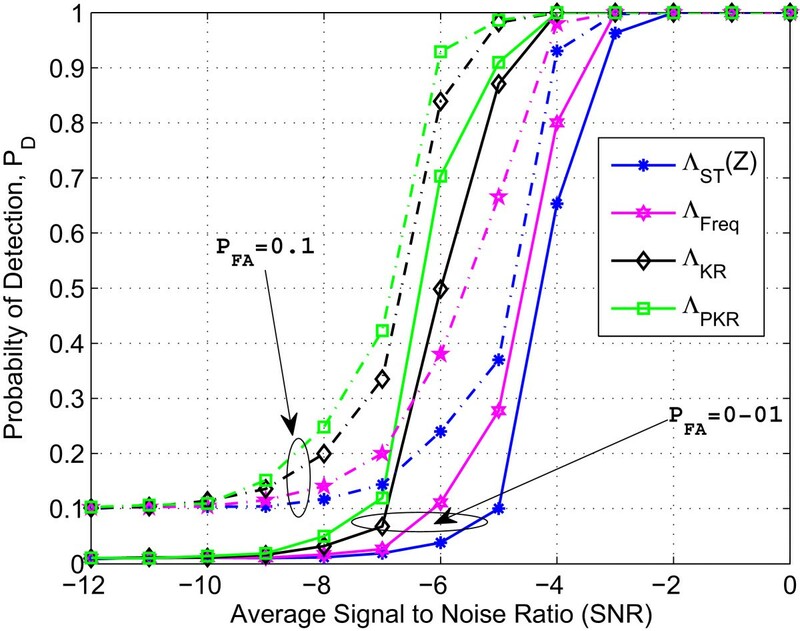 ROC curves for comparison of detection schemes: sample support size M = 70, number of vector samples per sub-block N = 10, number of antennas L = 4, noise uncertainty α nu = 2, and average SNR κ ̄ = - 10 dB . AUC curves (solid lines for α nu = 1 and dashed lines for α nu = 2) to assess the effects of number of samples M : number of vector samples per sub-block N = 15, number of antennas L = 4, shadowing σ dB-spread = 4, and average SNR κ ̄ = - 12 dB . Normalized MSE of the estimator of covariance matrix under hypothesis ℋ 1 .
where Σ is the true spatio-temporal covariance matrix, Σ ̂ j is the estimated covariance for each estimator in the Monte Carlo simulation j, . F 2 is the Frobenius norm, and Javg is the number of Monte Carlo simulations. The results confirm that for small sample support, estimators of Σ used in the case ΛKR(Z) and ΛPKR(Z) have smaller error. In Figure 7, we show the AUC plots to analyze the effect of shadowing (i.e. σdB) both in the presence and absence of noise uncertainty, α nu = 1.5 and α nu = 1, respectively. It is clear from these results that the effects of shadowing are very small on the performance of the detection schemes. However, we can see that by incrementing σdB, a slight improvement occurs in the performance of the detection schemes ΛTR(Z), ΛST(Z), and ΛPS(Z). The most obvious reason for this interesting outcome can be the heavy-tailed distribution of the primary signal strength due to the log-normally-distributed shadow fading that behaves in such a way at lower SNR . AUC curves (solid lines for α nu = 1 . 5 and dashed lines for α nu = 1) to assess the effects of shadowing σ dB : sample size M = 80, number of vector samples per sub-block N = 15, number of antennas L = 4, and average SNR κ ̄ = - 8 dB . 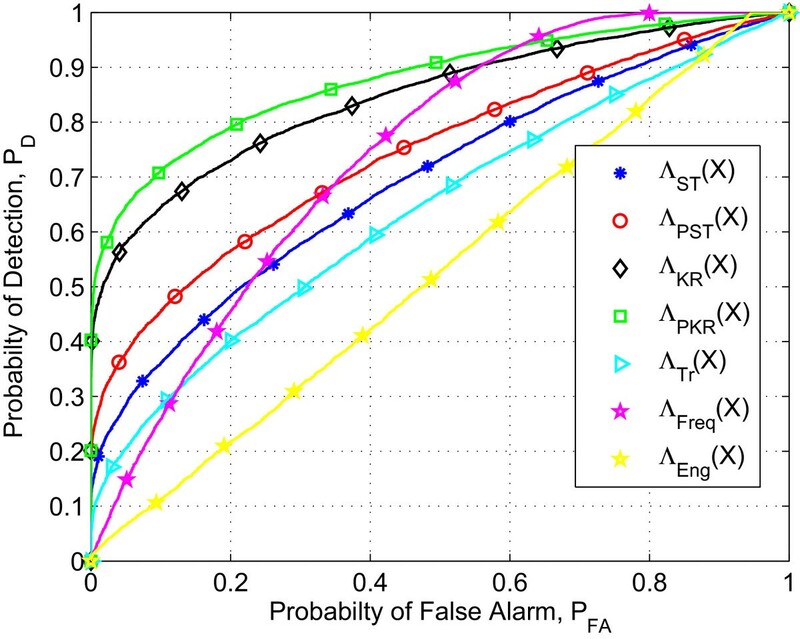 In Figure 8, we show the AUC plots to analyze the effects of noise power uncertainty. 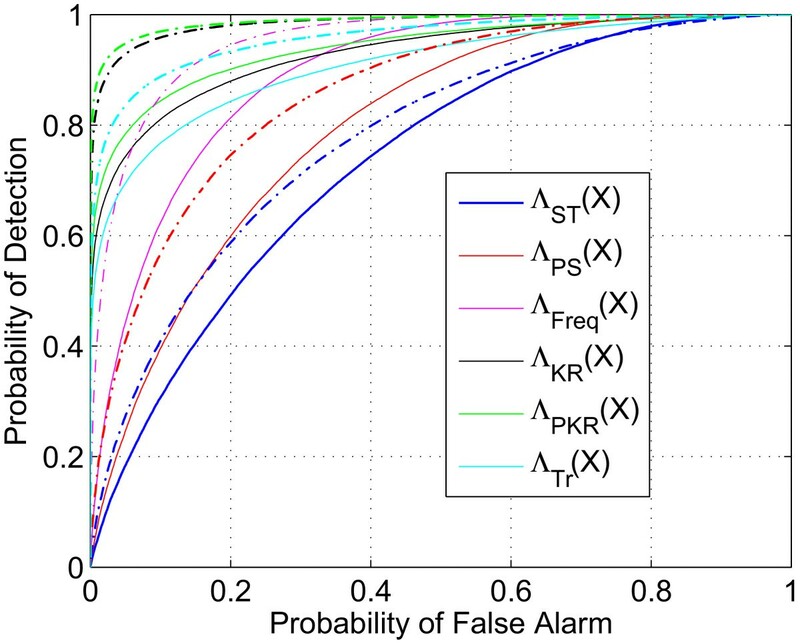 The results show a robust behavior for the detection schemes against the noise power uncertainty. Once again, we observe that the performance of the proposed schemes ΛKR(Z) and ΛPKR(Z) is better than other schemes that do not exploit the underlying structure of the received signal. AUC curves to assess the effects of noise uncertainty α nu : with sample size M = 80, number of vector samples per sub-block N = 15, number of antennas L = 4, effect of shadowing σ dB-spread = 4, and average SNR κ ̄ = - 8 dB . 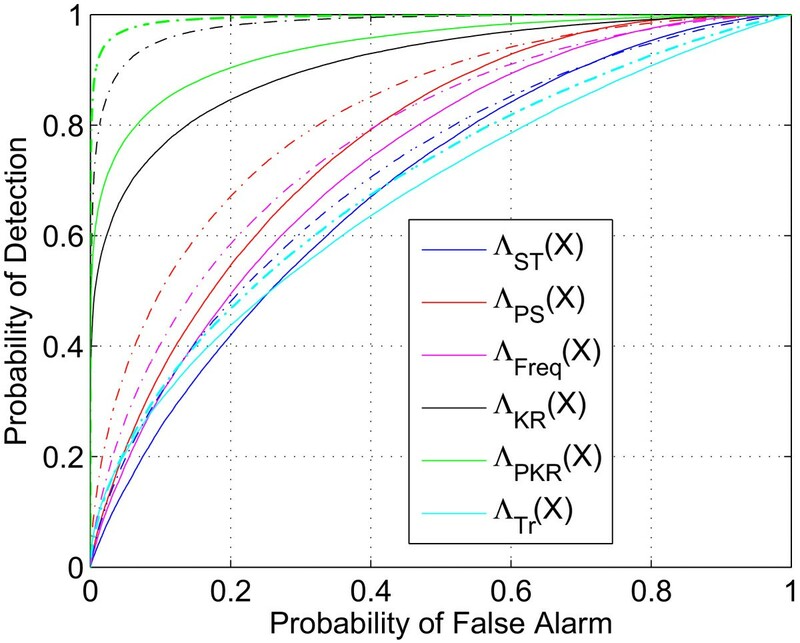 Finally, keeping the probability of false alarm P F fixed, we simulate the performance of the detection schemes by plotting P D against different values of average SNR κ ̄ . The simulation results are shown in Figure 9. The results clearly show that for different SNR values, the proposed schemes consistently perform better than the detection schemes that do not exploit the covariance structure. P D vs average SNR: number of vector samples per sub-block N = 15, number of antennas L = 4, M = 80. In conclusion, we can say that the exploitation of inherent structure of covariance matrix both in frequency and time domain leads us to robustness against the small sample support compared to the ST-GLRT in (9). In the previous set of experiments, we analyzed the proposed schemes for detection of a Gaussian signal with separable spatio-temporal covariance matrix in unknown additive uncorrelated noise. In the present set of experiments, we perform simulations to illustrate the application of the proposed detection schemes in cognitive radio, i.e. with an actual communication signal instead of a Gaussian signal and with a non-separable spatio-temporal covariance matrix. For the simulations, we have used an ODFM-modulated DVB-T signal (8-K mode, 64-QAM, guard interval 1/4, and inner code rate 2/3) with a bandwidth of 7.61 MHz. We have considered a 4 × 4 Rayleigh channel with unit power and an exponential power delay profile with length 64 samples (at a sampling frequency of 7.61 MHz). The additive noises at each antenna are generated as a zero-mean complex Gaussian process. We used a noise power different at each antenna with average SNR κ ̄ = - 8 dB . To analyze the schemes, we plot ROC curves with N = 15 vector samples per sub-block. The rest of the parameters are given in the captions of the figures. In Figure 10, we plot the ROC curves for the case when the channel delay spread is 0.779 μ s with and without noise power uncertainty. In this figure, we can easily see that the detectors ΛKR(Z) and ΛPKR(Z) clearly outperform the other detectors, even for this realistic spatio-temporal correlation. In Figure 11, we repeat the experiment of Figure 10 for a channel delay spread 0.097 μ s (almost flat fading channel). Even for channels with low-frequency selectivity, we can see that the detection schemes ΛKR(Z) and ΛPKR(Z) consistently perform better compared to the rest of the detection schemes. However, compared to Figure 10, in Figure 11, we can see interesting results that the detector which ignores temporal correlation outperforms spatio-temporal correlation-based schemes due to the low selectivity of the channel.Before commenting on these interesting results, for further confirmation, we need to have a single and quantitative figure of merit, so we plot AUC curves in Figure 12. ROC curves (solid lines for α nu = 2 and dashed lines for α nu = 1): sample support size M = 70, number of vector samples per sub-block N = 15, number of antennas L = 4, channel delay spread 0 . 779 μ s, and average SNR κ ̄ = - 8 dB . ROC curves (solid lines for α nu = 2 and dashed lines for α nu = 1): sample support size M = 70, number of vector samples per sub-block N = 15, number of antennas L = 4, channel delay spread 0 . 097 μ s, and average SNR κ ̄ = - 8 dB . AUC curves (solid lines for channel delay spread 0 . 779 μ s and dashed lines for channel delay spread 0 . 097 μ s) to assess the effects of number of samples M : number of vector samples per sub-block N = 15, number of antennas L = 4, and average SNR κ ̄ = - 8 dB . The AUC curves in Figure 12 demonstrate that the proposed detectors have better performance compared to the traditional detection schemes, for different values of sample support. In order to see the effect of delay spreads, we consider two types of channel delay spreads (0.097 and 0.779 μ s). 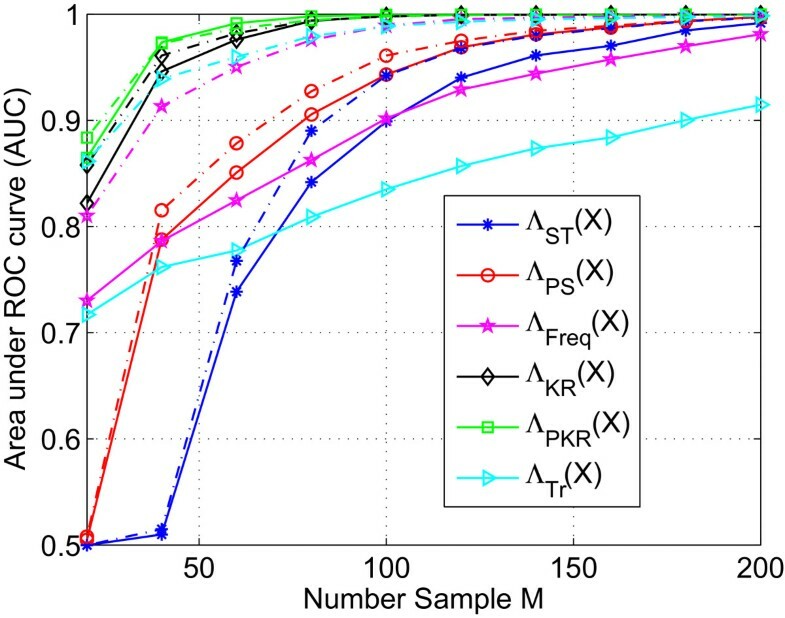 The results in Figure 12 confirm that the proposed schemes ΛKR(Z) and ΛPKR(Z) consistently outperform other schemes in small sample support regime. 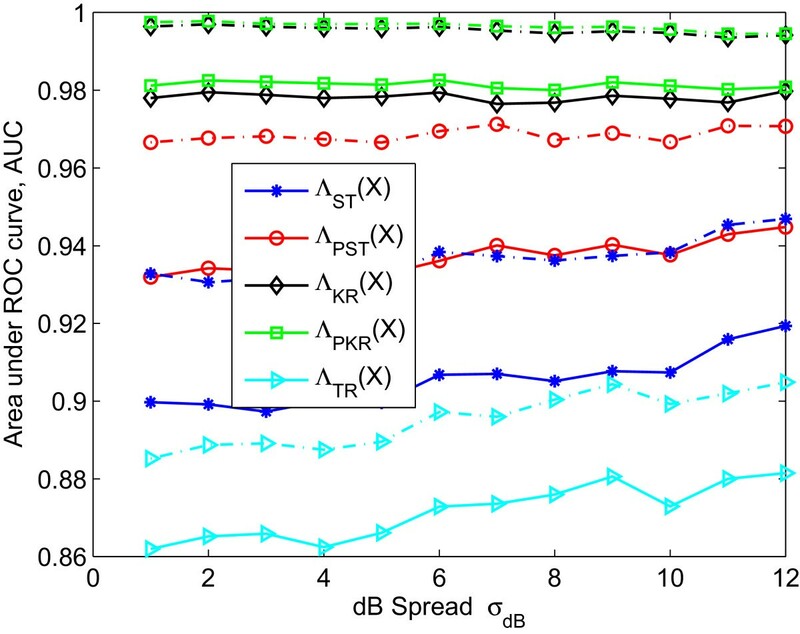 We can also see that in general, the performance of all schemes is degraded for different values of delay spreads; since the larger the delay spread, the larger the degradation incurred. However, we can see that compared to rest of the detection schemes, ΛKR(Z) and ΛPKR(Z) show more robustness against changes in the delay spread. We can further observe an interesting outcome in the case of the detector that ignores temporal correlation and the frequency-based approximate GLRT, where we can see that the performances of these two detection schemes are quite different for the two channel delay spreads. This is also evident from comparison of ROC curves in Figures 10 and 11. The possible explanation for this can be that for a short channel delay spread (i.e. 0.097 μ s), the multi-tap channel adds negligible temporal correlation. On the other hand, in the case of channel delay spread 0.779 μ s, we have temporal correlation imposed by the channel on the temporally uncorrelated transmitted OFDM signal. Therefore, the inclusion of temporal correlation as an additional detection metric is not helping in the case of delay spread (i.e. 0.097 μ s). 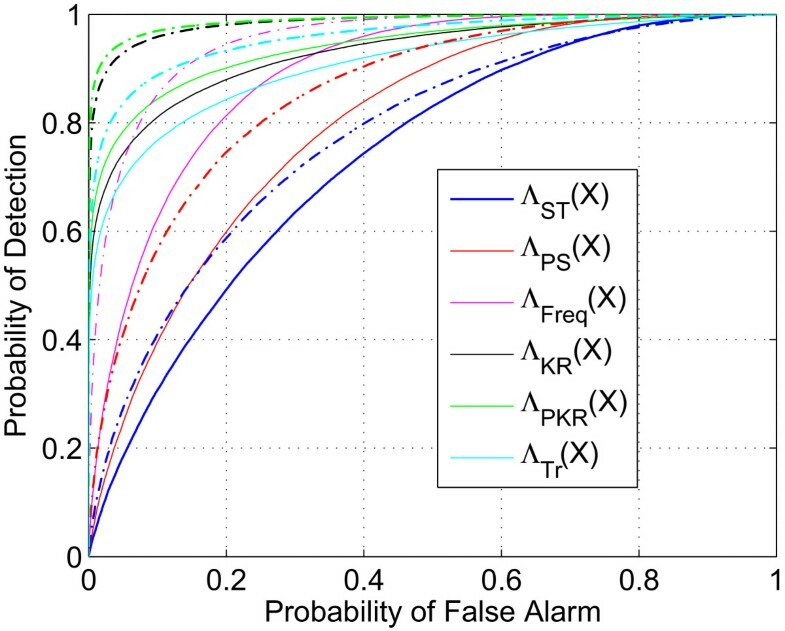 In order to further analyze the detection performance of the proposed schemes, in Figure 13, we compare the results by plotting P D vs average SNR κ ̄ . 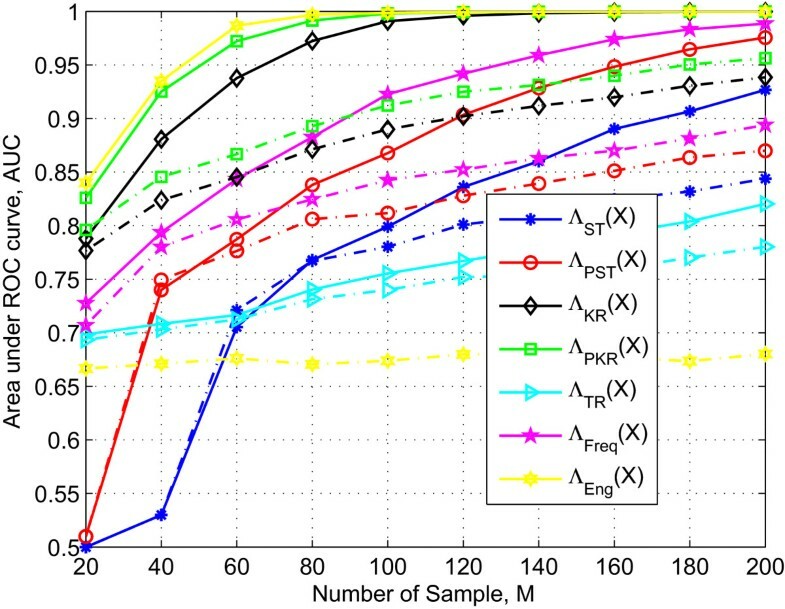 Once again, we can observe that the proposed schemes outperform the remaining detection schemes presented in this paper. 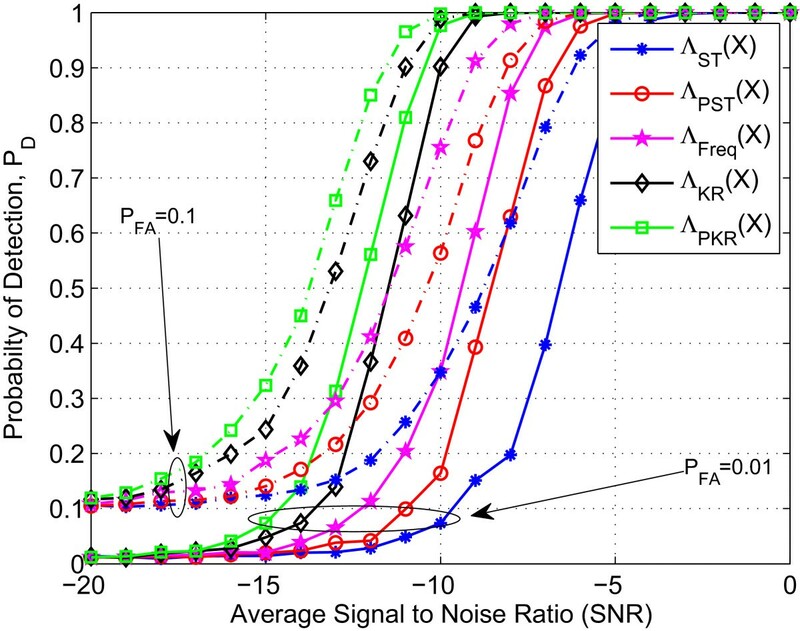 P D vs average SNR: number of vector samples per sub-block N = 15, number of antennas L = 4, M = 80, channel delay spread 0 . 097 μ s.
In this paper, we have proposed novel detection schemes that exploit the spatio-temporal correlation present in the received observations at a multi-antenna receiver. When exploiting the spatio-temporal correlation, we have observed that the GLRT performs poorly when the sample support is small. To cope with this problem, we have proposed detectors that are robust against the sample support. The proposed detectors (approximately) exploit the inherent spatio-temporal structure of the received covariance matrix by using the properties of persymmetric matrices and the Kronecker product of the spatial and temporal covariance matrices. The performance of the proposed detectors has been evaluated with the help of numerical simulations, which show important improvements compared to the traditional schemes. a We begin with the complex base-band signal sampled at the specific Nyquist rate. b These values are maintained during Monte-Carlo process. In order to create noise power uncertainty, these values are affected by random uncertainty at each run. f e j θ n = 1 , e - j θ n , e - j 2 θ n , e - j 3 θ n , … , e - j N - 1 θ n T .
This work was supported by the Catalan Government under the grant FIDGR- 2011-FIB0071.